Mitchell and Johnson WLD+211T Network Music Player and Radio. 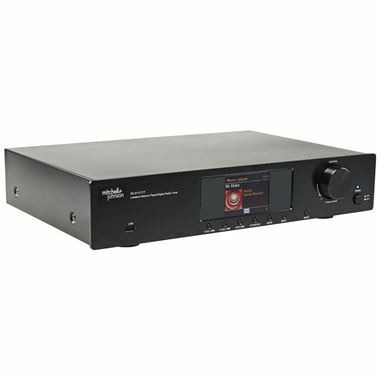 The WLD-211T is an audio component that can integrate into your existing hifi set up, much the same as a traditional radio tuner except it comes with all the advanced technology necessary to integrate with your computer based digital music storage system. Once connected to your home network router (via wireless or ethernet cable connection), it will give you access to over 16,000 digital radio stations via the internet, or listen to any of the music tracks stored on your computer or network attached storage (NAS) drive, giving you access to your entire library without the need for any other device. In addition to the remote control handset that comes with it, if you own an Android or iOS device you download the free UNDOK remote control application allowing you to browse all of your music from the palm of your hand. In addition to all this, the WLD+211T can stream your favourite tunes from Spotify via the Spotify Connect app. Lossless music streaming featuring our unique 'Sound Shaper' DSP giving enhanced sound quality on playback of compressed files including SPOTIFY. Full uPnP support. Windows Media Player compatible. Fully DLNA compatible. Apple compatibility with DLNA software application. Windows Media Audio and iTunes playlist compatible. Brushed aluminium remote handset which also operates SAP201V amplifier and CDD201V CD player.